These Best-Selling T-shirts will Fly off the Shelves! Often times we’re asked what our top selling t-shirts are. Baseball Raglans top the list, season after season. Here at Blankstyle, it’s an undeniable truth that our baseball raglans are the cat’s meow. From infant and toddler sizes to adult, heathered variations, full color blocked versions and even cropped styles, this tee sells and sells and sells! We sell thousands of these shirts year after year to our big and small business customers, and they all just can’t get enough. A raglan sleeve does not specifically refer to the 3/4-sleeved two-toned baseball tee that we know and love. A raglan sleeve is actually one that begins at the neck, rather than at the edge of the shoulder. There are many variations of the raglan sleeve, but the two-toned ‘baseball-style’ version, often with 3/4 sleeves, might be the best recognized. The 3/4 sleeve length is an ideal choice for many, giving more coverage than a regular tee shirt, but long sleeves and even cap sleeves now all come in this style for those who plan to workout, lounge, go to work or even play baseball in style. After a few seasons gaining momentum, the baseball raglan has now completely and utterly exploded in popularity–with many different brands now trying their hand at the style. The results are great, with more diversity and more options to choose from than ever. Whether you’re looking for something to spice up your clothing line, printing for a sports team, dressing up your employees, or just find a comfortable, good-looking shirt something to value, we’ve got a huge selection here. What better place to start than with American Apparel—who has 3/4-sleeve raglans to fit the entire family. The BB453 is American Apparel’s Unisex Poly-Cotton 3/4 Sleeve Raglan Shirt. It boasts perhaps the broadest range of two-toned color combination shirts on the market. American Apparel even named the BB453 its February Staff Pick. Since American Apparel’s 50% polyester 50% cotton blend is prepared using combed cotton, you can expect these shirts to be very soft and very lightweight. The BB453 is also available in Youth Sizes (BB253) as featured in Emma Magazine’s summer issue, Kids Sizes (BB153), and even infant sizes (BB053)! Bella/Canvas is also making waves in the baseball raglan pool. The 3200 Unisex 3/4-Sleeve Blended Baseball Tee is available as the standard poly-cotton blend; however, Bella/Canvas goes one step further with their baseball tees. The C3200 is available in the tri-blend variety, as well! Rather than adhering to a strictly color-block style (two solid colors-poly/cotton), Canvas offers several color combinations based on a tri-blend heather grey body with solid sleeves. Besides the standard 3/4-sleeve baseball raglan, Bella also offers the 2000—a 100% baby-ribbed cotton version for the ladies. If you are looking for a more traditional baseball raglan, you may want to direct your attention to the Augusta Sportswear 420 Adult Baseball Jersey and the Augusta Sportswear 421 Youth Baseball Jersey. These styles are ideal for sports teams and are available in several standard color combinations. They feature a fishtail long bottom for a very relaxed fit. Similar to the Augusta Sportswear model is the Sport-Tek Colorblock Raglan Jersey (T200). Rather than a 50% polyester/50% cotton blend, the T200 is 100% ring-spun cotton. The Anvil 2184 Adult Cotton Baseball Tee is made with Anvil 100% heavyweight cotton and is the most durable of the ¾-sleeve raglan group. The Alternative Apparel AA2089 Men’s Baseball T-shirt takes an ordinary baseball raglan and shatters the mold. The AA2089 offers exciting color-ways, such as the patriotic ‘Stars’ (a tri-blend white body with a red collar, blue arms, and white stars from the shoulder to the sleeve cuffs), ‘Bandana’ (tri-blend heather grey with red paisley sleeves), and ‘Camo’ (tri-blend brown body with an orange collar and camo sleeves). Besides these unique color combinations, the AA2089 is also available in more traditional combinations of white body and colored sleeves. 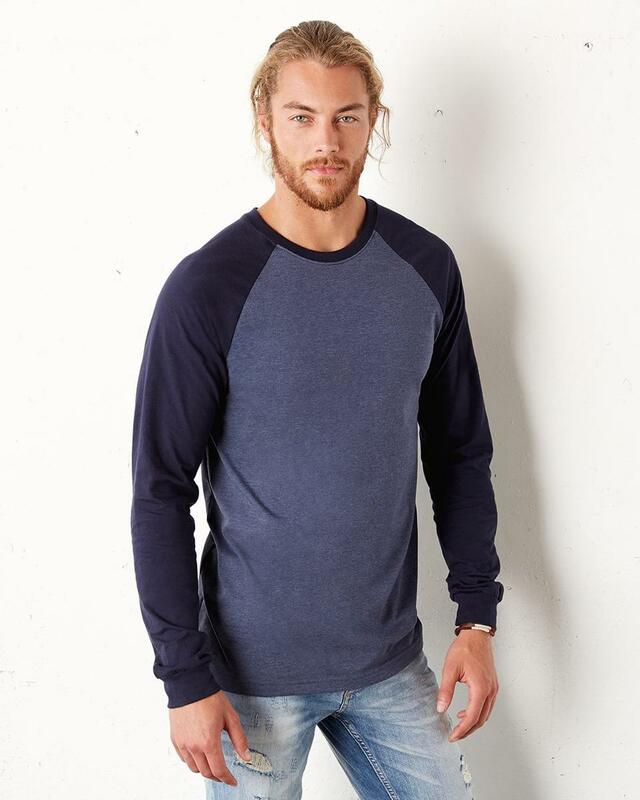 Alternative Apparel also offers the AA1989 ¾-Sleeve Raglan Henley. Complete with the standard Henley neck buttons, the AA1989 is another example of Alternative Apparel being…well…alternative. Anvil’s 2184 ¾-Sleeve Raglan Tee revisits the traditional baseball raglan look with a price point ideal for the recreational softball team. The Anvil 2184 boasts a 100% cotton heavy weight make up. at 6.1oz this garment is tough enough to steal home in. Some other ¾-sleeve baseball raglans include the pigment-dyed colors of the Chouinard 7066, the recognizable Champion T137, the 100% moisture-management-fabric Badger 4133 (Youth: 2133), and the LA T 6930 Vintage Baseball Tee (Youth 6130). As you can see, 3/4-Sleeve Baseball Raglans have grown up over the years. While traditional styles still exist, the genre has become one chock full of interesting options. When considering your new product line, perhaps you may want to give the baseball raglan a second glance. What was once one particular style has evolved into an entire category of styles. After all, if you can’t decide on short sleeves or long sleeves this summer, there’s always a compromise—the 3/4 sleeve baseball raglan.